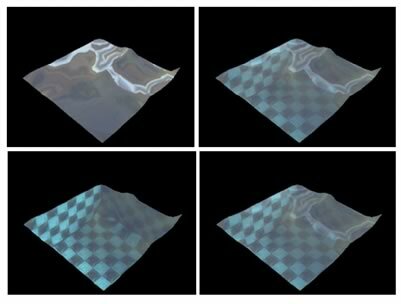 This article outlines the process of creating a water simulation with semi-realistic properties for use in a typical game engine or other real-time 3D environment. 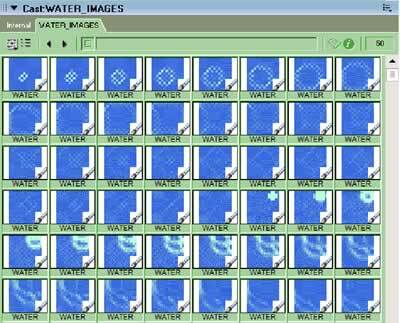 Water simulation is broken down into three major areas: wave propagation, refraction, and reflection. Also discussed are additional solutions for multi-texturing and tiling of the textures needed to produce the simulation, as well as discussion of a technique to incorporate a projection into texture space to simulate a cubic container such as a pool or trough without the underlying geometry. 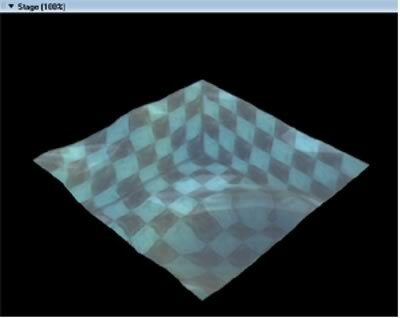 Figure 1: Water simulation with projective texturing, refraction, reflection, and secondary texture blending - #OpenGL renderer. Download the source file for this movie as a ZIP archive (~900K). Figure 2: Managing exchange between old and new water arrays per-frame. Figure 3: Manipulating water arrays for wave propagation based on previous neighboring values. Lingo implementation of McCusky's more complete example in , optimized by reducing the sampling algorithm to a single cell in each direction (as opposed to 2 or 3). Figure 4: Non-optimal (left) and optimized (right) triangle interlay patterns for water mesh to be used with droplet based wave forms and array-based propagation. Figure 5: Basic formula of Snell's Law, for light traveling between two surfaces with differing refractive properties. Figure 6: Implementation of Snell's Law on a per-vertex basis. Adapted from C/C++ source code by Vlachos and Mitchell in . Figure 7: Implementation of Snell's Law on a per-vertex basis. Adapted from source code by Anton Pieter van Grootel in . Figure 8: Implementation of simple container simulation on a per-vertex basis. Adapted from C/C++ source code by Vlachos and Mitchell in . Figure 9: Implementation of reflective texture coordinates. Adapted from source code by Anton Pieter van Grootel in . Figure 10: Water with a base refract map and an overlaid reflect map, with reflect at 100% opacity (top-left), 50% opacity (top-right), 0% opacity (bottom-left), and the simulation default of 35% (bottom-right). As a final added detail, the water simulation creates a very low-res image that calculates the color of the wave at a given vertex. This is presented as a very performance-friendly way of simulating a Fresnel term, without any of the calculation usually involved in computing such solutions. It must be noted, however that increasing the size of the texture drastically increases its computation time, and images of sufficient size will bring the entire simulation to a halt. By using the texture blurring capabilities on modern graphics hardware, very low-res images can produce acceptable results. Figure 11: Water textures at 16x16 resolution and color-ramped from blue to white based on vertex height.